Story: Fräulein Kassandra is the teacher at the beehive, teaching all the young bees about being a bee. Background notes: Fräulein Kassandra was one of the characters in the original story by Waldemar Bonsels from 1912. While she has been changed some in the following adaptions, she is still the kind teacher at the beehive. 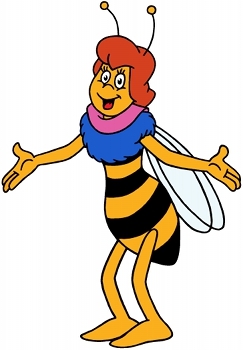 Like Maja she was adapted into the cartoon version of the book in 1975 (visual design by character designer Susumu Shiraume) and appeared in the first episode of the series Mitsubachi Māya no Bōken/Die Biene Maja (German voice by Lorley Katz). When the cartoon was adapted into comics in 1976, Kassandra was also transferred to comics. Later, when the series was transferred to games, Kassandra was also transferred to games. The first appearance of Kassandra appears to be the third game, Maya the Bee: The Great Adventure for Game Boy Advance from 2002. Only a few figurines with Fräulein Kassandra has been observed so far, but most likely she has appeared on other types of merchandise.